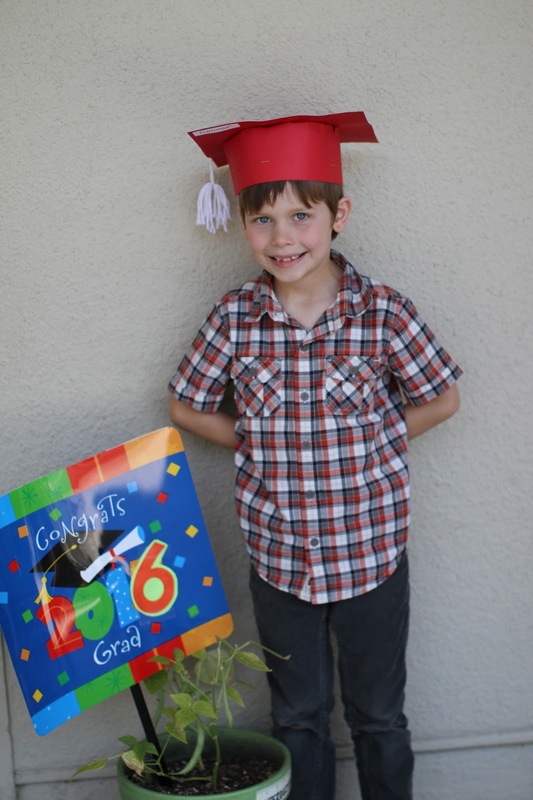 You guys, I am over here all "How is Connor done with kindergarten?! Didn't he just start yesterday?" Seriously, this year has flown by. It doesn't feel like a whole school year ago that I was dropping him off for his first day. I'm going to miss all the adorableness and innocence that came with kindergarten. It truly was a special, special year. ^^ Literally running to line up after getting his diploma from his teacher…which, it was a fake diploma (just a white piece of paper rolled up and tied with a string). Connor couldn't get over the fact that they would give him a fake diploma during the ceremony and his real one after it. ^^ Connor and his amazing teacher. Connor loves her oh so much and I definitely feel the same. Connor actually said about this picture in a sad, sad voice, "This is the last known photo of me and Mrs. Pippin." Oh, that kid. They did the kindergarten graduation ceremony on the last day of school, during school hours. It was outside on the front lawn. One of my favorite parts may have been when all the kids came marching out of their classroom to pomp and circumstance. The kids then sung a few songs before getting their (fake) diplomas. After the ceremony was a little reception. All the kids got yearbooks (the school gave them out for free). I tried getting Connor to get some of his classmates to sign it, but he refused…in fact said in a voice that I wish I could bottle it up because I hear it from him far too often, "Do I have to?" And just like that, kindergarten is behind us. I am excited for first grade for Connor. But I will definitely miss the adorableness of kindergarten. The colorful rugs, the tables down the center of the room, parents coming in to help with "centers", the kids having their own playground, study buddies. It really was a good year.